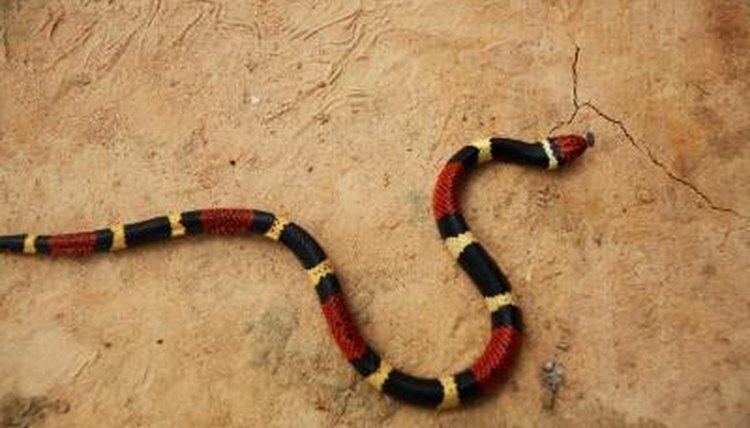 “Red touches yellow, kill a fellow; red touches black, good for Jack” -- the coral snake has inspired rhymes and fear for decades. Coral snakes are in fact reclusive and tend to only bite humans when directly stepped on or handled; no coral snake-related deaths have been reported since the late 1960s. Coral snakes can live more than a decade in captivity; that's plenty of time to study these dangerously beautiful reptiles. Every coral snake starts out life gestating inside an egg for approximately 60 days. Newborn coral snakes hatch in late summer, August to September, and measure around 7 inches long. Though small, these baby coral snakes emerge fully venomous. To inject venom, they must hold their prey while using a chewing motion on them. A newborn coral snake’s fangs are likely too small to sufficiently pierce through any sort of thick skin, so they stick to small insects like centipedes and spiders until they grow large enough to wrangle frogs, lizards or other small snakes. Eventually they can reach 30 inches long. Two New World coral snake species live in the United States: the common or Eastern coral snake and the Arizona or Western coral snake. The Eastern coral snake (Micrurus fulvius) is found throughout the Southeastern U.S. from North Carolina to Louisiana and Florida. It lives in pine and scrub oak sand hills, and hides under palmetto bushes. These snakes spend most of their time underground, surfacing most often in the spring and fall to mate. The Western coral snake (Micruroides euryxanthus) is found in the thorn scrubs, desert-scrubs, woodlands, grasslands and farmlands of central and southern Arizona and extreme southwestern New Mexico. Female coral snakes are mature and ready to reproduce around 2 years old or when their snout-vent length is almost 22 inches long. Males sexually mature a bit earlier, between 21 months and 27 months or when their snout-vent length reaches nearly 18 inches. After mating in the spring and fall, a female coral snake lays five to seven eggs in underground cavities or hollow logs. Captive coral snakes, with proper care and diet, can live anywhere from seven to more than 10 years in captivity. Coral snakes are finicky when it comes to eating in captivity, and may refuse food or even starve to death. Still, once nourished with the proper high-protein diet, some coral snakes have survived for more than a decade in captivity. The lifespan of a wild coral snake is a bit of a, well, wild card. The species is reclusive and solitary, preferring to avoid human contact. This makes their life expectancy difficult to track and measure, and thus the average life expectancy of coral snakes in the wild is unknown.